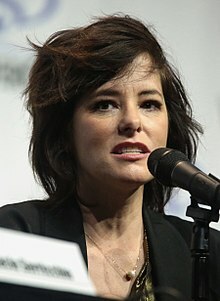 Parker Christian Posey (born November 8, 1968) is an American actress and musician. Following her role in Richard Linklater's 1993 cult hit Dazed and Confused, she became known during the 1990s after a series of roles in independent movies such as Party Girl (1995) and The House of Yes (1997) that gained her the nickname "Queen of the Indies". She later played improvisational roles in Christopher Guest mockumentaries, including Waiting for Guffman (1996), Best in Show (2000), A Mighty Wind (2003), For Your Consideration (2006) and Mascots (2016). Her other notable movie appearances include You've Got Mail (1998), Scream 3 (2000), Superman Returns (2006), and the Woody Allen-directed movies Irrational Man (2015) and Café Society (2016). On television, Posey has guest-starred in numerous series, such as Will & Grace, Boston Legal, Futurama, The Good Wife, Louie, Parks and Recreation, and Search Party, as well as starring in the Netflix adaptation of Lost in Space. ↑ Corliss, Richard (February 17, 1997). "Queen of the Indies". Time. Wikimedia Commons has media related to Parker Posey. This page was last changed on 3 September 2018, at 16:28.